We are proud of our clinic's facility and hope it meets your needs as well. 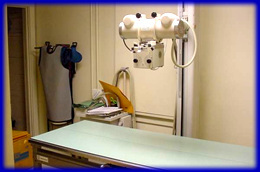 As soon as possible, upon arrival, you and your pet will be escorted to one of our two exam rooms. Our in-house laboratory is able to deliver rapid, accurate results. Our hospital area has a surgical suite, treatment area and recovery ward. We also have an isolation room to house any contagious pets. 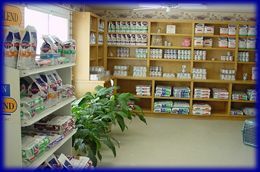 We have a fully stocked pharmacy for most of your prescription needs. Our nutritional line provides our clients the proper diet for their pet from adolescent through geriatric years. We also offer prescription diets for those patients with special health needs. Our kennel and grooming area are climate controlled for year round comfort. Please feel free to call and set up a tour of our facility. Sophie is one of our staff blood donor dogs. As dogs age, we know that they, like people, have a greater risk for developing certain diseases and conditions. For example, we know that the incidence of problems such as heart disease, kidney disease, arthritis, and oral/dental disease increases with advancing age. However, when such diseases are diagnosed in their early stages, treatment to cure such disorders or delay their progress can be given in most cases. For that reason, we recommend that all of our canine patients that are seven years of age or older have an annual geriatric evaluation. This evaluation includes a complete and thorough physical exam, a complete blood count, blood chemistry profile, urinalysis and thyroid test. As in all health evaluations, early detection is the key as it allows for more and better treatment options. Older cats can develop a myriad of medical problems, but there are three common problems that we see in geriatric patients: diabetes, kidney disease, and hyperthyroidism. All three diseases affect the other systems over time and are, if left untreated at an early stage, fatal. If these chronic disease processes are detected soon after they start, they may be very treatable and controllable. 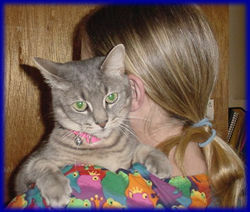 Generally, we recommend that cats seven years and older have blood drawn and checked annually. Diagnostic tests include blood chemistries, a complete blood count, urinalysis, and thyroid test. It is in this way we can detect the problem before it becomes a major medical problem. As in all health evaluations, early detection is the key as it allows for more and better treatment options. We have tried to make our senior care program as affordable as possible, so that your pets' may benefit from the same tests and evaluations that we use on our own aging pets. We know how difficult it is to say goodbye to an old friend, therefore we hope to keep you and your pet together as many years as possible. A major part of your pet's health is oral and dental hygiene. If your pet is 3 years or older, he already has tartar and plaque build-up on his teeth and probably needs a dental cleaning. Most older pets will have advanced tartar build-up and some degree of gum disease. The problem begins when plaque and tartar are allowed to build up on your pet's teeth. Plaque harbors the bacteria, which can infect gum tissue and the root system. This often results in healthy teeth having to be extracted because the root structure has been compromised. A more serious consequence of dental disease occurs when the infection spreads via the bloodstream to other vital organs such as the lungs, heart, and brain. The first step in improving your pets oral health is a complete dental exam. If a dental cleaning is recommended for your pet, a doctor will discuss the procedure with you. Since we have yet to figure out how to get most pets to sit in a dental chair with their mouth open, the procedure will be done under anesthesia. Preliminary blood work prior to the dental is recommended to rule out any underlying health conditions that might compromise the safety of anesthesia. 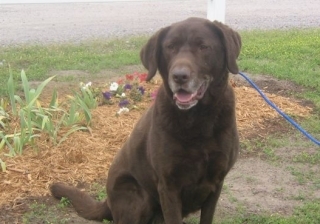 Older pets should have a more comprehensive blood profile run. Dental procedures are recommended annually in most cases. Ask us about home dental care and procedures you can perform at home to ensure your pet's oral health. Our boarding kennel is an all indoor climate controlled facility. Each animal is kept in an individual compartment. Each dog is carried to an enclosed outdoor exercise area two to three times daily. All animals are fed high quality pet food. When requested, special diets may be fed and you are welcome to bring their regular diet from home. All boarding pets must be current or made current on their vaccinations. Please call us to discuss these specifics. All pets may be dropped off or picked up during regular office hours Monday through Saturday. Reservations are recommended especially for holidays and Master's week. There are many high quality pet diets on the market. Because we cannot stock them all, Acute Care Veterinary Clinic has chosen to offer Hill's Science Diet Pet Foods. We are proud of our selection and the dedication Hill's has shown to the veterinary profession. We try to keep in stock a wide variety of Hill's products and would be happy to special order those we don't normally carry.